Federal Acquisition Regulation 52.233-1 (48 CFR 52.233-1) contains a dispute clause that is incorporated into prime contracts for federal construction projects. This regulation is set forth at the bottom of this article and provides that the prime contract is subject to the Contract Disputes Act (41 U.S.C. s. 7101 en seq.). The Contract Disputes Act is a vital part of federal contracting. The contracting officer will then render a decision for claims of $100,000 or less within “sixty days from the contracting officer’s receipt of a written request from the contractor that a decision be rendered within that period.” 41 USC s. 7103(f)(1). With respect to claims of more than $100,000, the contracting officer “shall, within 60 days of receipt of a submitted certified claim…(A) issue a decision; or (B) notify the contractor of the time within which a decision will be issued.” 41 USC s. 7103(f)(2). 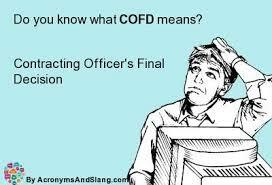 If the contracting officer notifies the prime contractor that it needs more time to render a decision, which is not uncommon, he/she is simply required to issue a decision within a reasonable period of time factoring in the size and complexity of the claim with the back-up information submitted by the prime contractor. 41 USC s.7103(f)(3). “Failure by a contracting officer to issue a decision on a claim within the required time is deemed to be a decision by the contracting officer denying the claim and authorizes an appeal or action on the claim….However, the tribunal concerned may, at its option, stay the proceedings of the appeal or action to obtain a decision by the contracting officer.” 41 USC s. 7103(f)(5). Once the contracting officer renders a decision on the claim, this decision is final unless the prime contractor (i) appeals the decision to the applicable agency board within 90 days from the date of receipt of the contracting officer’s decision or (ii) initiate an action in the United States Court of Federal Claims within twelve months from the date of receipt of the contracting officer’s decision. 41 USC s. 7104. The opinion in The Hanover Insurance Company v. U.S., 2014 WL 2192148 (Fed.Cl. 2014), illustrates the importance for prime contractors to comply with the Contract Disputes Act and corresponding Federal Acquisition Regulation 52.233-1 (governing disputes and incorporated into the prime contracts) prior to instituting litigation against the federal government. In this case, the United States Army Corps of Engineers (“Corps”) engaged a prime contractor to perform work for an Everglades upgrade project. The Corps default terminated the prime contractor due to issues pertaining to the prime contractor’s dewatering plan. The Corps made a demand on the prime contractor’s performance bond surety to either complete the balance of the unperformed contract work or tender a new contractor to complete the contract work. The Corps also denied claims the prime contractor submitted for additional costs relating to the dispute over the dewatering plan (that ultimately led to the default termination). The performance bond surety tendered a completion contractor and executed a tender and release agreement with the Corps that obligated the surety to pay the Corps many millions of dollars which represented the difference between the amount to be paid to the completion contractor to complete the contract work minus the unpaid balance of the original prime contractor’s contract. The tender and release agreement provided that the prime contractor and surety could ultimately challenge the Corps’ default termination. Subsequently, the prime contractor and its surety filed separate complaints against the federal government in the Court of Federal Claims challenging the default termination. Ultimately, the prime contractor wanted the Corps’ default termination converted into a termination for convenience; this would, in turn, result in the federal government reimbursing the surety the many millions the surety tendered plus other related costs incurred by the contractor in the performance of the project. (The prime contractor also sued the federal government to recover its costs tied to the claims it submitted to the Corps relating to the dewatering dispute that the Corps denied.) These lawsuits were all consolidated. The Hanover Insurance Company, supra, at *4 (internal citations omitted). The Hanover Insurance Company, supra, at *7. In other words, the prime contractor and surety will need to submit a written claim, await the contracting officer’s obvious denial of the claim, and then re-institute the action in the Court of Federal Claims based on the denial. Since the contracting officer’s decision converting a default termination into a termination for convenience seems fairly transparent, the prime contractor and surety argued, as they should, that it would be futile to comply with the Contract Disputes Act when the contracting officer is going to obviously deny the claim. Notwithstanding this transparent fact, the Court of Federal Claims relied on case law where a prime contractor sitting in a similar default termination situation was required to submit a claim pursuant to the Contract Disputes Act challenging the default termination in order for the Court of Federal Claims to have jurisdiction. (a) This contract is subject to 41 U.S.C. chapter 71, Contract Disputes. (b) Except as provided in 41 U.S.C. chapter 71, all disputes arising under or relating to this contract shall be resolved under this clause. (c) Claim, as used in this clause, means a written demand or written assertion by one of the contracting parties seeking, as a matter of right, the payment of money in a sum certain, the adjustment or interpretation of contract terms, or other relief arising under or relating to this contract. However, a written demand or written assertion by the Contractor seeking the payment of money exceeding $100,000 is not a claim under 41 U.S.C. chapter 71 until certified. A voucher, invoice, or other routine request for payment that is not in dispute when submitted is not a claim under 41 U.S.C. chapter 71. The submission may be converted to a claim under 41 U.S.C. chapter 71, by complying with the submission and certification requirements of this clause, if it is disputed either as to liability or amount or is not acted upon in a reasonable time. (d)(2)(i) The Contractor shall provide the certification specified in paragraph (d)(2)(iii) of this clause when submitting any claim exceeding $100,000. (f) The Contracting Officer’s decision shall be final unless the Contractor appeals or files a suit as provided in 41 U.S.C. chapter 71. (h) The Government shall pay interest on the amount found due and unpaid from (1) the date that the Contracting Officer receives the claim (certified, if required); or (2) the date that payment otherwise would be due, if that date is later, until the date of payment. With regard to claims having defective certifications, as defined in (FAR) 48 CFR 33.201, interest shall be paid from the date that the Contracting Officer initially receives the claim. Simple interest on claims shall be paid at the rate, fixed by the Secretary of the Treasury as provided in the Act, which is applicable to the period during which the Contracting Officer receives the claim and then at the rate applicable for each 6–month period as fixed by the Treasury Secretary during the pendency of the claim. This entry was posted in Contract Disputes Act, Government Contracting, Termination for Convenience and tagged 52.233-1, Contract Disputes Act, government contracting, performance bond by David Adelstein. Bookmark the permalink.